« The Nebula Awards winners…and a great KDD (again)! 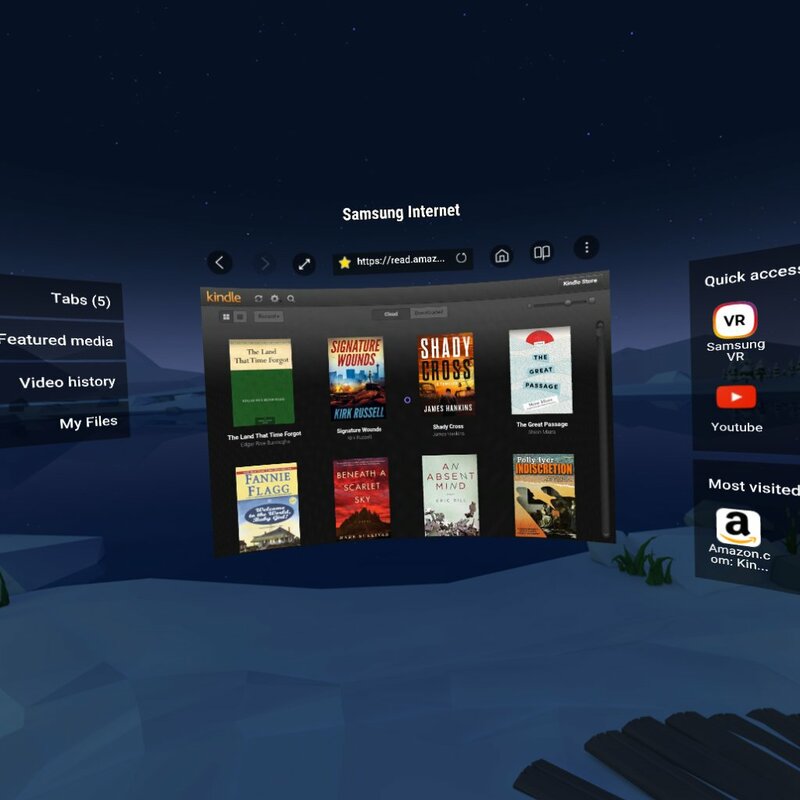 Absolutely, the number of people who want to read books in virtual reality at this point is probably vanishingly small…even smaller than the e-book market was before the Kindle was released in 2007.
for suggesting this timeline (and they’ve been quite accurate in the past). Next, they need to also want to read e-books. The number of people who read books at all regularly is quite a minority in itself, so we definitely are talking about an unusual population. I’ve been wanting to read my Kindle books in VAM space, and I hadn’t found a way. I did find a way to read some other books, but not my purchases from the Kindle store. at work (at lunch, or on a break), it is uniquely isolating. It gives me a real sense of being somewhere else, which, while I love my job, can be a good mental reset. Right now, I may watch Netflix or Hulu, and I do play some games (but gaming is not the majority of my time in VAM space, contrary to what I commonly hear people assume). However, I want to read. 🙂 If I play a game for a bit of a reset, then I may want to spend some time exercising and reading. I do want to be clear: we aren’t where I want to be yet. I need some way to hands-free change “pages”, so I can read while doing floor work, like crunches. I can watch video that way, but with the current implementation, I tap the side of my head (really my headset) to change a page. That’s not convenient…I still expect Amazon to make a big move into VAM space before the end of the year, and while that’s most likely to be Prime Video at a minimum, a book reading “experience” is also a possibility. Audiobooks/text-to-speech would be another way to go, but in this post, I’m talking about sight reading. I’m using Samsung Internet on my Gear (my phone, which powers it, is a Samsung Galaxy S7 Edge…one generation back, now). This next step is what I believe is new, and is what made it work. I select the menu in my top right corner of the main screen, then select, “Request Computer Version” (you can see the little selector circle…in this app, I tap the side of the headset to choose it…in some apps, I “eye gaze”). Then, I was able to log into the site…and I could use it like I could on my laptop! Well, it’s a little clunkier…I can’t go back as easily, but I can still read. Here’s a shot of my library…I don’t usually show you the book covers, but I feel like these are small enough and the purpose is right for it to fall under Fair Use. 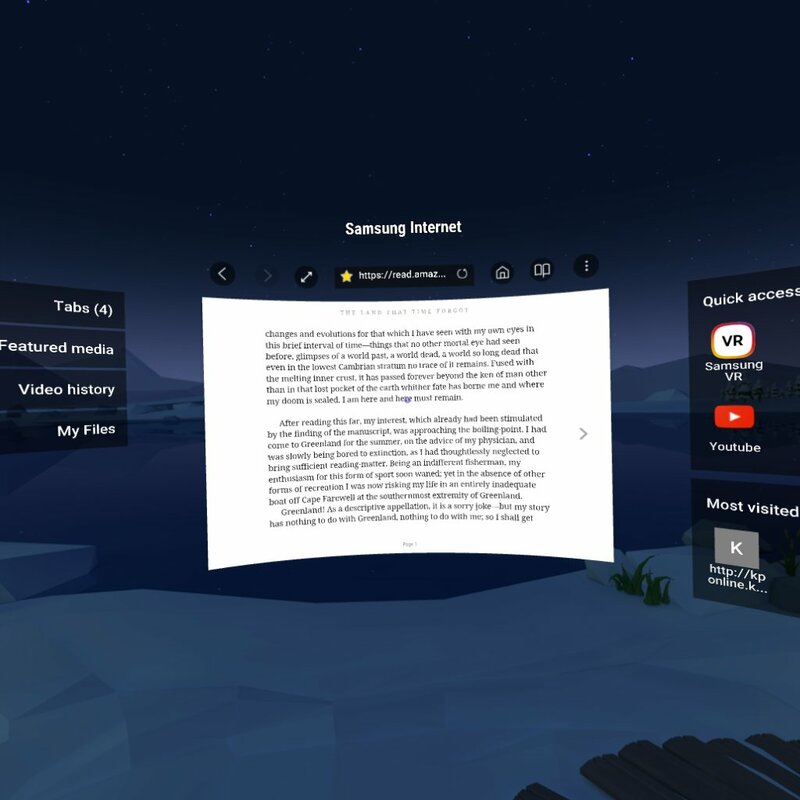 Now, this is a 360 degree environment…I can look around, even look behind me, but the book is in front of me…like it was on a movie screen, but I find it a comfortable size to read. In fact, I’d love to get more words on the page, so I didn’t have to tap so much. 🙂 Hmm…I may be able to change that, I’ll look. I’m sure Amazon could do something that would advance through the book on its own. I can change the size of the image…that’s part of Samsung Internet, although it doesn’t change dramatically. will do that. 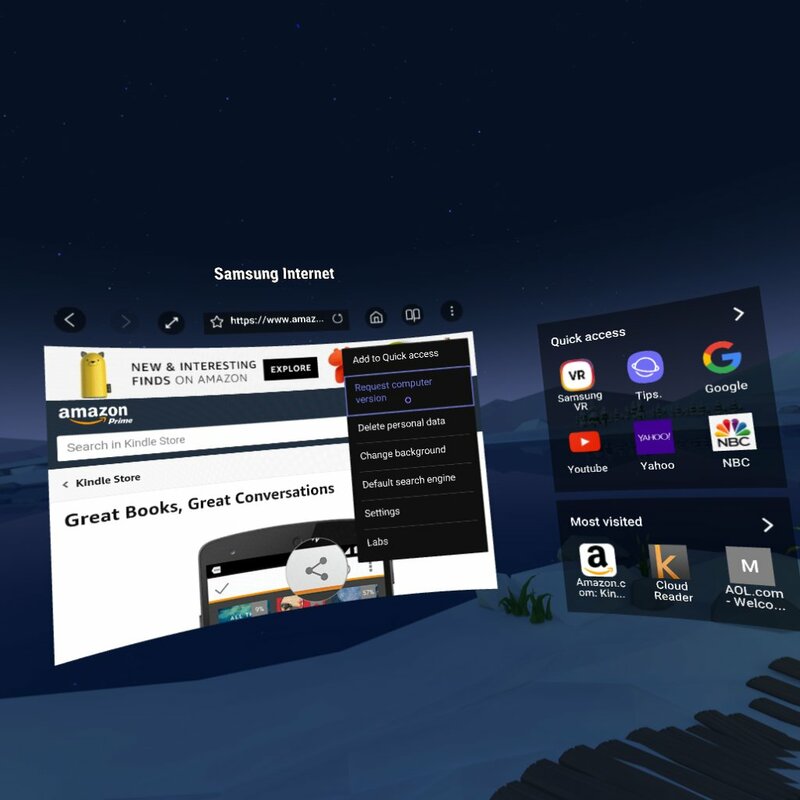 🙂 We did an interview about VAM space, with an emphasis on Amazon and books…and I know Len makes 360 videos, so probably has images to use. Again, this is in no way everything I want. When I’m on a plane later this year, I’m assuming I’ll be able to use my headset (I’m traveling domestically…and the headset isn’t powered, but who knows?). I’d plan on reading on my Kindle Fire, too, but I can see switching between games, videos, and books without taking off the headset (I would need to download some books before I go, unless I can connect to wi-fi…that’s what I’ve been doing so far to read, streaming it). We are on the bottom rungs of the ladder which is the future! is “Up to 80% off top book club picks by Goodreads on Kindle”. Check them out…there are some good deals! This entry was posted on May 24, 2017 at 3:08 am and is filed under Tips, Virtual/Augmented Reality. You can follow any responses to this entry through the RSS 2.0 feed. You can leave a response, or trackback from your own site. WOW! I want. I have too many so I will not get but I want. You have probably already heard of this company but just in case here it is. They buy new kindle paper whites, waterproof them (which voids the warranty), and then resell them with their own warranty. I would so do what the BBQ guy does just to see people’s reactions. Oh yeah, $239 if I remember right for the WiFi with ads OR send your’s in and they do it for $99 with a 6 month warranty. That’s interesting! I’ve been surprised that Amazon hasn’t released a waterproof Kindle yet…if they do, that’s going to mess with this company’s business model! That’s exactly what I was thinking but it’s not just kindles. They also sell other waterproofed products as well. It made me wonder ‘if this small company can do this then Amazon can also do it and has chosen not for for one reason or another.’ I mean Nook has a waterproofed kindle but not sure if it’s the quality this one is. This one looks top notch. Amazon could do it, but adding $100 to the cost might not make sense, as this company is doing. There is also the issue of scale…what they are doing may not be able to be economically upscaled for millions of devices a year. A six month warranty might also be insufficient, and they may be worried about Customer Service calls. I think it’s likely we get at least one “waterproof” Kindle EBR directly from Amazon this year, but we’ll see. Here is the video I meant to link above. Woops.